Why should you design your own t-shirt with Zippi? If you’re bored of seeing the same old stuff in your wardrobe, it’s definitely time to design your own t-shirt! Luckily, customising a t-shirt with Zippi has never been easier. In just a few simple clicks, you can decorate a tee with a design of your choice. Here are a few reasons why you should treat yourself to one of our personalised tops! When your current outfits are getting monotonous, creating a t-shirt is a great way to spruce up your wardrobe without breaking the bank. Our trendy tees don’t just look awesome, they’re also super-soft and comfy too. With different styles for men and women available, there’s no excuse not to get one. Can’t find anything you want in a store? All the more reason to design your own t-shirt using a piece of artwork that suits your style and taste perfectly. We have thousands of artist designs in our collection, so no matter what your style, you’ll definitely find something to showcase your personality. Whether it’s a retro, pop art, floral or vintage design, you’ll stand out from the crowd and make passers-by jealous! Zippi is the best selling print on demand website in the UK because we offer a wider range of products than many others. This is good news if you’re based in the UK or Europe as you don’t have to wait forever for your orders to arrive! European orders typically arrive within 2-3 days and most of our UK orders arrive the very next day. We even have same day despatch available for the majority of our products. That means your personalised t-shirt can be with you in no time! 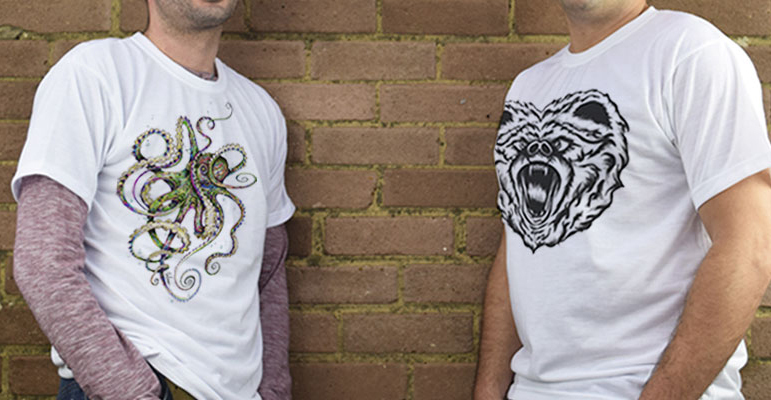 We use first-rate printing technology to ensure your chosen design looks sharp, crisp and striking on the finished t-shirt. Go for a photo t-shirt if you want to celebrate birthdays or important occasions and make some memories. Use our photo editor to upload pictures of friends and family, especially the embarrassing ones! You can even put selfies on there for a bit of fun – see our guide on how to take the ultimate selfie. What are you waiting for? Let your imagination run wild and design your own t-shirt with us!